Ron Brinkmann, lead developer of Shake (Apple) and author of The Art and Science of Digital Compositing gave a talk in recent Etech Conference. They would like to build tools for the challenges in digital films, but then they found the tools are also useful for real world situations. Spectacles (you must remember the very big ad of Calton Draught), pedestrian simulation for public safty, like pilgrimage bridge crowd simulation in Mecca. Ars Technica’s Nate Anderson in “The wisdom of digital crowds: from Lord of the Rings to a bridge near Mecca". Visual effects work draws from real-world research into all sorts of things: image processing, artificial intelligence, physics, and mathematical movement algorithms. But Apple’s Ron Brinkmann argues that the process is bidirectional, with tech developed for the visual effects world beginning to make its way into real-world scientific simulations—even in Mecca. She ask good questions in the end of the article. If the movie/tools is earning a lot of money from entertainment industry, then maybe we don’t need any more practical usages to proof its legitimacy. That’s pragmatism. But we can always found truth indirectly via the glance of the ripple, or children’s innocent smiles. There’s an alterity also there we might really want to enjoy. “Taiwan has no better friend…"
Taipeitimes: “US official warns of PRC arms buildup". The US State Department’s chief specialist in Taiwan affairs says the US is “deeply concerned" over China’s military actions that threaten Taiwan and has recommitted Washington defend Taiwan despite issues that have come between the two countries in recent years. “Taiwan has no better friend than the United States," Thomas Christensen, the Deputy Assistant Secretary of State for East Asian and Pacific Affairs, told a hearing on US-China relations by the Asian subcommittee of the House Foreign Affairs Committee on Tuesday. The morning newspaper reading. Especially after recent history studying. I don’t think the web-as-platform is the right metaphor for what’s coming. I personally believe we are moving away from the web-as-a-bazillion-web-pages to a flow model: there the web becomes a conduit for traffic flowing through social networks. That’s what I believe is happening with the take-off of Twitter, too. The mirror stage is described in Lacan’s essay, “The Mirror Stage as formative in the function of the I as revealed in psychoanalytic experience", the first of his Écrits, which remains one of his seminal papers. Some have crudely put this as the point at which the child ‘recognises’ him- or herself in the mirror image, but this is unfaithful to what Lacan has in mind and also confuses his terminology. Lacan’s emphasis here is on the process of identification with an outside image or entity induced through, as he puts it, “insufficiency to anticipation – and which manufactures for the subject, caught up in the lure of spatial identification, the succession of phantasies that extends from a fragmented body-image to a form of its totality that I shall call orthopaedic – and, lastly, to the assumption of the armour of an alienating identity, which will mark with its rigid structure the subject’s entire mental development" (Lacan, Écrits (rvd. edn., 2002), ‘The mirror stage’, p. 5). It is significant that this process of identification is the first step towards the manufacture of the subject because all which follows it – the transition into the Imaginary and the Symbolic order (see below) – is based on this misrecognition (méconnaissance): this is the process that Lacan detects as manifesting itself at every subsequent identification with another person, identity (not to be confused with ‘identification’) or suchlike throughout the subject’s life. This is the start of a lifelong process of identifying the self in terms of the Other. 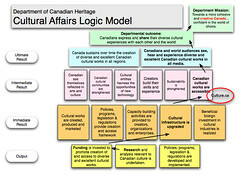 Based on the photo of last Oct. Croatian International Culture Portal Roundtable Meeting, I redraw Carsten QUELL, the research manager of Department of Canadian Heritage, his slide: “Cultural Affairs Logic Model". It’s a very good and clear diagram to position cultural portal in governmental cultural policy roadmap.